With Genedata Selector for Precision Genome Editing, we provide a highly valuable platform for a rapidly emerging field. Genedata, a leading provider of advanced software solutions for R&D, today announced the release of Genedata Selector for Precise Genome Editing, an innovative solution for data management and analysis of CRISPR related genomic data. Genedata Selector for Precise Genome Editing targets research organizations that require an infrastructure solution that tracks experimental data throughout the genome editing process as well as streamlines and automates the data flows from target gene specification to guideRNA selection to genotype-phenotype validation. Combining sophisticated software with Genedata’s team of scientific consultants, Genedata Selector for Precise Genome Editing provides a full service solution for CRISPR data management and analysis. Genome editing techniques like CRISPR are revolutionizing molecular biology and equipping scientists with the ability to precisely modify the DNA of essentially any organism. 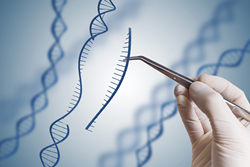 While advances in next-generation sequencing technology have made genome editing faster and easier, researchers still face challenges in efficiently managing and analyzing the experimental data. For example, currently available software tools address only individual steps of the entire experimental process and make the data analysis process very manual and prone to errors. Furthermore, the lack of integrated data management to track results along the experimental process make the performance of precise genome editing experiments in a GxP environment impossible. And finally, lack of data security can cause high risks for IP protection. These are just a few of the many challenges that Genedata Selector for Precise Genome Editing addresses. Genedata Selector stores and maintains up-to-date, fully annotated public and proprietary genomes of any organism of interest. The software also includes sophisticated algorithms for comparative genomics, copy-number analysis, statistical expression data analysis, and signaling & metabolic pathway analysis. All of this combined with a built-in patent search provides the most robust platform for CRISPR target selection. Genedata Selector supports the use of all different CRISPR protocols providing researchers with full flexibility in the design of gRNAs. All available gRNAs are automatically tested for uniqueness and off-target binding resulting in the highest quality gRNAs available for selection. Designed gRNAs can be visualized within their genomic context including mutation and transcriptional profiles, sequencing coverage information, and copy number variations, which can be combined with functional protein motif information. This allows researchers to select optimal gRNAs for their specific experiments. All of this information is maintained within the Selector software and can be easily shared with colleagues. Once a CRISPR experiment has been performed, Genedata Selector can validate the experimental result through sequence analysis. Whether for analyzing targeted locus or whole-genome sequences, Genedata Selector provides automatic workflows for the processing of raw sequence data and comparing sequencing results with reference genomes to validate gene editing results. The software also stores all phenotypic related cell information like growth profiles, expression data, and metabolomics variables for easy genotype-phenotype relationship analysis.